Google have taken yet another step forward in their war against the content farms who fill up their ( & our) results with spammy nastiness. Writing on the official company blog last night Amay Champaneria and Beverly Yang, Search Quality Engineers for the search giant revealed new functionality that allows you to block the sites you don’t want to see. This functionality isn’t aimed at sites that don’t quite meet your expectations in terms of the search you’ve made, but rather at the sites that you find offensive, pornographic or in their words “generally low quality” ie the content farms chasing traffic by writing about subjects purely because they’re popular search terms. You’ll need to be signed into your Google account to use the new features, but once you have and you click on a result and return immediately to Google you’ll be asked if you want to block all results coming from that domain. Click yes and you’ll receive a confirmation message as well as the option to undo your block. Once you make a new search these results will magically disappear! You’ll be notified by a message either at the top or bottom of your results that pages have been blocked. 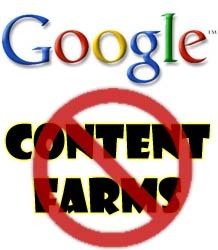 So, back to Farmer and the content bandits. At the bottom of the blog post Amay and Beverly write “while we’re not currently using the domains people block as a signal in ranking, we’ll look at the data and see whether it would be useful as we continue to evaluate and improve our search results in the future.” In other words they’re recruiting us to help them get rid of the spammers. As marketeers how do we respond to this? Well the good news is that you don’t need to hire the editorial team from The Times! But you should be producing original and high quality copy that’s rich and useful to your readers, subscribers and visitors. If you’d like to know more about Farmer and how to craft website content that actually benefits from this update then give us a shout at lucy@the-levels.com and we’ll get back to you.